Dog problems develop mainly because of what owners “Do” and “Don’t Do” with their dogs. Mostly people get dogs with the “expectation” that their dog will be perfect. They may even do a little dog obedience training. The reality is most people do not “Get It” as it applies to what the dog expects – and needs. When people get dogs, some of those dogs bring issues with them. With other dogs—- some issues develop because of their relationship with their owners. Why do problems result from the relationship between owner and dog? 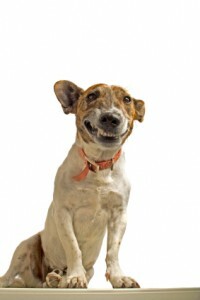 An owner does not require anything of their dogs, (such as a sit or down), instead, these dogs do exactly what they want until owners scream, “Enough already!” Some owners spoil their dogs by constantly lavishing love and affection on the dog, which often times creates dominance and aggression. In addition, way too many dogs have just an overabundance of energy that is left unmanaged by their owners. This leads to a bunch of other dog problems like: digging, chewing, and barking. While each dog can have different behavioral problems, fixing them first requires a basic understanding of your relationship with your dog – from the dog’s point of view. expectations of what to do and when to do it. As an example let’s take a very simple activity – the routine of eating. With food, dogs understand very clearly about the order and control of food. Food has high value to your dog. IF twice a day, 7 days a week you eat first, then you feed your dog – requiring them to sit and down (work for food) – then this is (1) reasonable, (2) predictable and (3) consistent. All given by you, in very reasonable, predictable and consistent ways, YOUR importance to your dog becomes even greater. Dogs “lock on and learn” the pattern of routines connected to any or all of the “valuable” things listed above. And with dogs, these routines begin to create security. Security breeds confidence in a dog. The more secure and confident your dog, the less stress and consequently the fewer dog problems you will have with your dog. It’s simple. You just have to do it consistently. If you think about it, all of these activities are “pack” activities and dogs really relate to all of the things that you do together as a pack – eating, resting, playing, walking and yes dog training together on obedience commands. Your dog must have reasonable life expectations that for him, are predictable and consistent. Doing sits and downs to earn all of these things create a routine that makes him feel secure). His need of and love of these routines will work for you over time allowing you to accomplish all of your doggie goals. To develop the best relationship you can have with your dog, remember that dogs communicate best with us when we take advantage of using our body language, eye contact and tone of voice. All of this will begin to create “calm expectations” with your dog as you build a lasting trust in the relationship with your dog. Have fun and begin to enjoy your new family member so we have more happy owners and dogs. We hope you found this article to be helpful. Please commenton below and let us know if it helped you. Also Like It, Tweet It, put it on Linked IN. Go crazy with it so everybody can be as smart about their dog as you are! Come visit me on FACEBOOK, we have a lot of fun over there. I highly recommend a book called Calming Signals by Turid Rugaas, a professional dog trainer from Norway. The books can be read in a few hours on a rainy Sunday afternoon, yet it can dramatically change the lives of dog owners and their dogs overnight. The combination of Jim Burwell´s recommendations above of being reasonable, predictable and consistent with your dog, and by mimicking the subtle cues of your dogs calming signals, people and their canine companions can have a healthy, happy, and peaceful relationship. Michelle: Turid Rugaas’ book Calming Signals is a great book. Glad you liked the article!